Very old wooden quilting frame ? Thread: Very old wooden quilting frame ? I was gifted this very, very old frame which is an enormous 10' x 9'. I have to replace the leaders which I know how to do. Does anyone know how to then load a quilt? The legs hold the frame together and can, I am thinking, be adjusted along the sides for different size quilts. But how to attach the quilt to the leaders has got me stumped. Close to 100 years old. I would think you would pin it on? Not sure if I'm totally understanding the situation. Maybe i can make my situation a bit more clear. After I attach the canvas leaders to each side, how do I go about adding and securing the backing, batting and top to the leaders? I will attach the canvas leaders with staples. The original hand wrought tacks were so rusted I could not reuse them. Thanks for any suggestions and ideas. We never know what may help so all advice is welcome. Last edited by ube quilting; 04-24-2018 at 04:38 PM. No ideas about the frame, but that's a lovely quilt top. I think you would pin the backing to both leaders, then lay the batting on top, then lay the quilt top on top of the whole thing and secure it with pins - basically the same as floating the quilt on a longarm, except it's a much deeper frame and you don't have rollers. I'm not sure how you are supposed to get to the middle of the quilt to hand quilt it though, and I think you would have to adjust the leaders every time you loaded another quilt. I'm not sure any of this makes sense. You pin the backing on the top and bottom to the leaders and stretch the frame taut. You then smooth the batting over the backing and then pin the top along the edges of the backing. With my board frame I used strips of waste fabric around the side boards and pinned along the quilt sides. You need to be able to roll the boards with the leaders as the edge gets quilted. In the old days, I don't think it was referred to as loading a quilt. I never heard that until the advent of the long arm quilters. This is not a task that I have done, but I did help pin a top prior to taking it off for hand quilting in the lap. I think you need to become friends with Mr. Google. If you google "how to set up and use a vintage wooden quilt frame", you should find plenty of help. Joe Cunningham, who's name you once saw often paired with that of Gwen Marston, has a DVD showing how to build and use a quilt frame. It may be in your public library. I have seen a small booklet showing how to set up and tie a quilt using a frame. By the way, that is a beautiful quilt top draped over the corner of the frame. I have one somewhat like it. The boards sit on stands and held together with C-clamps. I don't use leaders but pin thumb tacks to attach the backing on to the boards then add the batting and finally the top. I pin the two opposite side first then adjust the board making it taut then repeat with the other two sides, it is not an easy process but I learned it at the Mennonite Quilt Center. I use mine when I tie a quilt. You quilt or tie all four sides and when you can't reach anymore you the unpin a portion of the board that are on the bottom and roll the boards that are on top with the quilt ( this is a two person job) until you reach the place that needs quilting. Repeat the process until you are finished. Excellent explanation. I have helped do this many times. 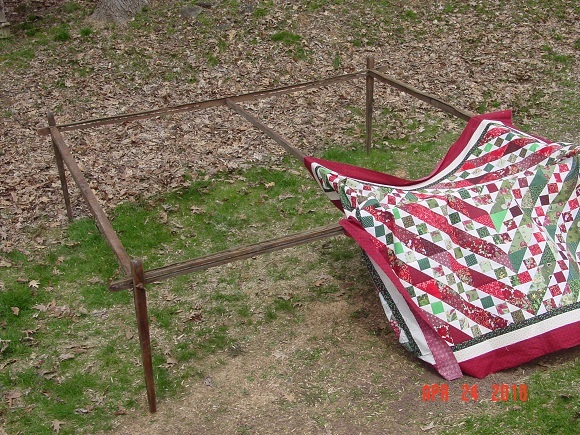 I would add that it takes two people to put the quilt on the frame as well as two people to roll what is finished when you can’t comfortably reach any more. I also recommend that you use heavy duty C-clamps. I would check for a you tube video. One other tip. Make sure the backing is three or four inched wider than the top on all sides. Thanks very much for all the great information. It is so helpful and I know I can do this now. This frame is not like any I have seen before but the basic idea and method should be similar. I appreciate the help from everyone so much. Thanks again. It appears that the frame is adjustable so when you have quilted all you can reach you need to roll the quilt and shorten up the frame. Are you saying that with this frame you quilt towards the middle instead of from the middle out? This is an interesting thread!! I never had a grandmother so missed those experiences. Yes, that's the way you do it. Only one of my grandmothers quilted (that I remember). Her frame hung from the ceiling in the living room, and was set up so that it could be raised to the ceiling when no one was quilting. (It was a winter activity.) I remember my aunts and older cousins all sitting around the frame quilting and talking. They used the Baptist fan on all quilts, as Grandmother's quilts were utilitarian. That was a really long time ago, though. So, even if you had a grandmother, you may not have seen this in action. This is the way I quilt all the time and the way my mother quilted for years. Put the quilt on the frame with thumb tacks and quilt until you can't each anymore then roll and continue , I have my own set of clamps. I did not have a board in the center of the frame. You can put a card table in center to prevent the quilt from sagging a little. Last edited by Iamquilter; 04-25-2018 at 05:23 AM. My mom had a frame like this. I used it for my first quilt, a king side sampler (35 years ago). I set it up in the yard, then used thumb tacks to get the backing on tight. Then laid the batting on and then the top. I was only basting, so I'd baste across and worked my way until I could not reach, then unclamped one bar and rolled and the basted quilt. Once I had it all basted, I took it off hand quilted it with a hoop, removing the basting stitches as I worked. I liked to sit in the big rocking chair and prop up one knee and braced the hoop so I had plenty of room underneath. I did the stab method, fully passing the needle back and forth between my hands (one on top and one underneath), but only pulling the thread tight on the upside. My cat loved to crawl in under the quilt and sleep on my lap. had to be careful so I didn't poke her with the needle! Last edited by Macybaby; 04-25-2018 at 05:58 AM. i have one of those that i bought at farm auction in PA. mine doesn't have legs. elders at the auction said this style was meant to sit on chair backs or suspended from cieling. i use dining chairs and c-clamps to hold the corners. i replaced the original leaders that were so old they almost disentegrated when touched . the corners of each of the polsa are densely dimpled from many decades of quilting. i cannot sit at a frame because of back problems, so i use the frame to hand baste quilts for hand or machine quilting. remove & put frame poles away until needed again. when basting i attach the back with even tension all four sides. i then slide the outer rails a bit if needs to be tighter. then lay out the batt ..then the top. if quilt no larger than double or queen size i reach as far toward center to start the basting, then work alternating sides until i'm out to edge. i learned the technique from book. they said to do giant cross from alternate corners across surface then horizontally & vertically. i used to do that but decided it keep it square like they said it would. i thread baste about every 3-4". if you want more on how i attach & set up pm me. My handquilting group baste the quilt before loading it..using big enough backing to attach to the leaders. I know it was meant to be hung from the ceiling when not in use. That frame is different from mine. With mine and with other's frames we've been hearing about, the sticks are loose when the clamp is taken off. I have it sitting on four chairs with the table under it in the middle to hold the sag. I have denim strips stapled onto the sticks and pin the quilt back to that. Then I add the batt and then the top. I usually re-pin now to include all layers in the pins. My Amish friend just lays the batt and top onto the back and lightly pins those to the backing only. I just found out how to do this my myself. You lay a fifth stick (board) over the middle of the quilt and clamp that down at both ends. Now you can loosen the two corner clamps and roll. Then the corner clamps can be re-tightened so that everything is taut again. Center board can be removed when necessary. This is similar to the frame that we use at a friend's church. We sew muslin to the quilt top (so not to damage the top itself) and be sure that the muslin, backing, and batting are long enough to be thumb tacked (pound with a hammer) to the frame. Since you have leaders, you can simply pin the muslin with quilt top attached to the leaders. We use C clamps to hold our 2 x 4 boards together. When you roll, you need several people on the opposite side to pull so that you don't lose the tautness of the quilt. While quilting the quilt, you will have to stretch it at times....just need extra hands. IF that is not clear, you can always contact me---I can put you in touch with my friend (the one who loads the quilt onto the frame each time). She is great!!! P.S. You were kind enough to send me some fabric when I was building up my stash....Hope to repay the favor!!! I might suggest that you attach canvas leaders on two opposite sides, with Snap Tape attached. Then I'd sew the other leader w/Snap Tape to the quilt. Much faster than pinning.